The distal radius has metaphyseal flare and three articular surfaces: scaphoid fossa, lunate fossa and the sigmoid notch. The dorsal and radial cortices are thin and the volar and ulnar cortices are thick: this explains the greater incidence of dorsal and lateral comminution and collapse. The volar surface is separated from the flexor tendons and median nerve by the pronator quadratus. Just beyond the distal edge of pronator quadratus the volar surface slopes distally and dorsally. This demarcation is called the watershed line. Volar plates should not be placed beyond this line as it would project anteriorly and also lack the coverage by pronator quadratus and cause flexor tendon irritation. Volar ligaments are attached to the volar rim. In between the volar ligaments and pronator quadratus lies the intermediate fibrous zone. Elevation of pronator quadratus with 1-2mm cuff of intermediate fibrous zone makes its repair easy. At the lateral edge of volar surface lies the radial septum, which gives insertion to the brachioradialis. Brachioradialis is step-cut in extended flexor carpi radialis approach to access the dorsal surface in complex intra-articular fractures of distal radius. The volar ligaments are short, stout and stronger while the dorsal ligaments are thinner and arranged in zigzag pattern, hence the volar ligaments become tensioned before the dorsal ligaments leading to dorsal tilting of the articular surface. Palmar ulnar corner is called the keystone of distal radius. It is the strongest and supports the lunar facet. It gives attachment to volar ligaments. Jacobs interpreted the wrist as having three columns each subjected to different mechanical forces and having discrete elements. Radial column is formed by the scaphoid fossa and the radial styloid. Due to thin cortex radially it shortens and tilts laterally after fracture which is best addressed by buttressing the altars cortex. Intermediate column composed of lunate fossa and sigmoid notch is the corner stone of distal radius. It usually fails in impaction and needs elevation and stabilisation. Ulnar column is ulna and TFCC complex. Distal radius fractures shatter the mechanical foundation of the most elegant tool humans have; the hand. One sixth of all fractures seen in emergency room. Most common fracture between 15-75 years. Three main peaks of fracture distribution are seen with three distinct groups: paediatric group between age 5-14, makes under 50 years and females after the age of 40 years. The first and last groups represent insufficiency fractures and the middle one represent traumatic fractures. Distal radius fracture is the most common osteoporotic fracture. Various classification systems available for distal radius fractures. Due to the large number of variables to consider and the broad spectrum of injuries no classification is adequate. Most classifications are based on location of fracture, number of intra-articular fragments, direction of displacement and involvement of ulna. A good classification should categorise the fracture type and injury severity to guide treatment. In 1951, Gartland and Werley published a detailed evaluation and classification system based on metaphysical comminution, intra-articular extension and displacement. In 1959 Lidstrom outlined a classification based on fracture line, direction and degree of displacement, extent of articular involvement and involvement of DRUJ. In 1965, Older proposed a classification that incorporated radial shortening as variable that determine the type. In 1967, Frykman identified the importance of ulnar involvement and publish a classification based on involvement of radiocarpal and radioulnar joints and the ulnar styloid fracture. In 1984, Melone heralded the contemporary era of classification by stressing the careful delineation of 4 components of radio carpal joint namely radial shaft, styloid, dorsal medial and volar medial fragments. Other modern classifications are Universal classification by Cooney, Mayo clinic classification and AO classification. In 1993, Fernadez classification was introduced, which was designed to be practical, determine stability, include associated injuries and provide general treatment recommendations. It identified fracture patterns that reflect specific mechanisms of injury. There were 5 types. 1- Bending, 2- Shear, 3- Compression, 4- Avulsion and 5- Combined. Treatment plan for distal radius is determined by patient factors, fracture pattern, fracture stability and associated injuries. Patient factors include age, lifestyle, mental status, associated medical conditions and treatment compliance. The course of treatment is decided by several variables which can be broadly divided into patient factors, fracture displacement, fracture stability and associated factors. The important questions to ask are 1) Is the fracture displaced or undisplaced 2) Is the fracture intra or extra articular 3) Is it reducible or irreducible 4) Is it stable or unstable. Most important variable with regard to fracture pattern is whether the fracture is intra-articular or extra-articular. In extra articular fractures, successful outcome needs restoration of certain parameters like radial length, radial inclination and palmar tilt. In intra-articular fractures in addition to the above articular congruity must be restored. Palmar tilt is measured on the lateral view as the angle between the line connecting the most distal point of volar and dorsal lip of radius and another line drawn perpendicular to the longitudinal axis of radius. Normally palmar tilt is about 11 degrees. Distance in millimetres between a line drawn perpendicular to the radius longitudinal axis at the level of tip of styloid and a similar line drawn at the level of ulnar articular surface is the radial length. Normally is is about 11 mm. Radial inclination is the angle between a line drawn connecting the tip of styloid and the ulnar corner of radial articular surface and a line perpendicular to the long axis of radius at the level of tip of styloid. Ulnar variance is the vertical distance in millimetres between the medial corner of radius and the most distal point on the ulnar articular surface. Carpal malalignment is assessed by the angle subtended by the longitudinal axis of capitate and radius. If the lines intersect within the carpus there is no malignment if outside there is malalignment. Acceptable reduction means >15 radial inclination, < 5mm radial shortening, <15 dorsal and <20 palmar tilt, ulnar variance negative or neutral, articular gap should be less than 2mm and the articular step <1mm. Standardised PA and lateral views and some times comparative views of opposite wrist are needed for accurate evaluation of these parameters. CT with 3D reconstruction is useful in complex injuries. Acceptable reduction range is also influenced by the physiological health of patient and functional demands of the patient. Patients with 3 or more factors have high chance of loss of reduction. Among these variables radial shortening is the most predictive followed by dorsal comminution. Non-operative treatment is sufficient in undisplaced fractures and reducible and stable fractures. If proven or predicted instability is ruled out, then short arm cast is sufficient, but weekly follow up with x-rays is needed for 3 weeks to rule out redisplacement. Cast is given for 4-6 weeks, but longer period may be needed in elderly and those with less stable fractures. Successful non-operative treatment needs satisfactory reduction and maintenance of reduction till union. Difficulty in reduction of intra-articular fragments and provision of adequate axial stability are major limitation of non-operative treatment. All displaced fractures of distal radius should have an attempt at reduction. Even those that require surgery should be reduced as it reduces pain and relieves pressure on soft tissue structures. More information can be gained from the post reduction x-rays than per-reduction films. Method of reduction is by giving traction, followed by anteriorly directed pressure to correct dorsal angulation. If the volar cortex is also displaced, then the deformity should be exaggerated to disengage the fracture ends. Other method is gradual traction using Chinese finger traps and counter weights. Operative treatment is indicated in those with irreducible fractures, fractures with predicted or proven instability and in those with bilateral fractures and polytrauma. The operative options available are per cutaneous pinning, external fixation, internal fixation or a combination of these techniques. Choice of surgery for reduction and fixation depends on patient factors like age, functional needs, occupation and handedness, fracture geometry, displacement and bone quality. Percutaneous pinning may be indicated in young patients with reduced or reducible fractures with instability. In severe intra-articular comminution and in elderly osteoporotic this treatment is inappropriate. It is also contra-indicated along with plating as k-wires can act as a conduit for infection. Percutaneous pinning can be broadly classified into extrafocal and intrafocal: pinning through the fracture site. The selected technique should achieve stability and avoid injury to nerves and tendons. Six basic percutaneous techniques have been described. Pure trans-styloid pinning by Lambotte, Ulnar-Radial pinning away from DRUJ by Depalma, Trans-Styloid and dorsal radial pinning by Stein, trans-styloid and ulnoradial pinning of posteromedial fragment by Uhl and Ulno-radial pinning with fixation of DRUJ by Rayhack. Among the various extrafocal techniques, 2 parallel trans-styloid pins with a third wire through the dorsal-ulnar corner is the most stable. Kapanji in 1976 described the intrafocal technique of putting 2 dorsal k-wires through the fracture site and levering it distally to reduce the dorsal angulation, and then advancing through the opposite cortex to buttress the dorsal cortex. Fritz modification is addition of a trans-styloid pin. Ruschel modification is addition of a lateral intrafocal pin to restore radial inclination and shift. Walten modification of intrafocal, intramedullary pins is useful in osteoporotic patients. Various studies have proven that in reducible intra articular fractures, percutaneous pinning results in more rapid return of function when compared to open techniques. It is well suited for young patients with reducible intra/extra-articular fractures. In patients with dorsal or volar comminution, maintenance of reduction by percutaneous pinning or casting may lead to rediplacement. In such patients, if satisfactory reduction is achieved by closed methods then external fixation is a feasible option. Percutaneous pinning may be added for additional stability. Such patients have a superior outcome with external fixation when compared to those treated by open methods, but some series have reported unacceptably high rate of complications. This recommendation is not applicable to patients with Barton fractures, they should be treated by buttress plating. External fixation may be bridging or non-bridging. Pins should not be inserted percutaneouslydue to high incidence of nerve and tendon damage and also to prevent open section defects due to eccentric drilling. Pins are inserted by limited open technique. Limited open technique utilises two 2.5 cm incisions. First incision is made on the radial side of forearm 10cm above the radial styloid. Second in ion is made over the dorsolateral aspect of index metacarpal. Proximal pin over the index metacarpal base goes into the third metacarpal base as well. After ligamentotaxis , the x-ray should show 1mm widening of radiocarpal joint than midcarpal joint. There are many external fix actors available for fixation of these fractures. But ideally the fixator chosen should radiolucent, allow independent positioning of pins, should allow re-reduction if needed. Usually 3.5mm Schanz screws are used for radius and 2.5 mm for metacarpals. Open reduction and plating is indicated in those with irreducible fractures and in presence of joint incongruity. Dorsal plating is done only rarely now due to poor soft tissue cover, tendon rupture etc. Volar plating through FCR or extended FCR approach is procedure of choice for plating. 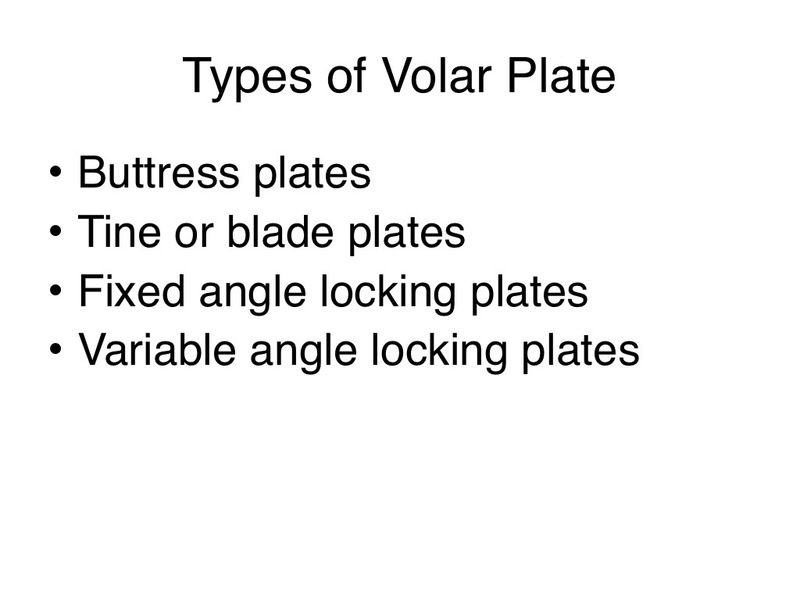 Volar plates fall into 4 categories: buttress plates, tine or blade plates, fixed angle locking plates and variable angle locking plates. Volar buttress plates with or without screws is used for Barton fractures. Blade plates are less commonly used as the blades or ones have to be put in predetermined by shape and position of tines in the plate. Fixed angle locking plates have the advantage of giving angular stability which gives it better stability. It can be used on the volar aspect in patients with dorsal angulation. Variable angle locking plates allow an independent trajectory to be chosen for individual distal screw to match the variable geometry and surface contour of distal radius. But they tend to be thicker and more prominent than standard locking plates. Locking plates rigid fixation and allow eary mobilisation evn in presence of osteoporosis and bone defects. Fragment specific fixation is a recent introduction. It is designed to fix each major fracture fragment by an implant specifically designed for that fragment. Subchondral support and rigidity can be enhanced using a combination of small implants designed for each major fragment taking into consideration the 3D geometry of distal radius. It allows placement of implants in orthogonal planes. Radial styloid is reduced first followed by lunate facets.